We are excited to introduce you to Samuel Duek who is bringing the Hola Mexico Film Festival to NYC from July 23rd to the 27th.Thanks to the New York International Latino Film Festival, on this, their 9th edition, Samuel has been invited to showcase a Mexican program unlike anything ever seen in the city . He has selected 12 feature films to represent whats happening in Mexico today in the world of film. In Spanish, all with English subtitles the screenings will include the presence of some of Mexico´s finest directors and actors. The screenings will also include fiestas and events with live music from Mexico and food from one of our favorites, La Esquina. Your fascination with Mexican films? Mexican films are extremely powerful. They represent life in a warm and crude way, tell it as it is. I love that film can really transport you, so for 90 or 120 minutes that someone is on the theater, they hear and see real images of Mexico! That creates a unique experience, so for those Mexicans that miss Mexico, it's a wonderful way to be magically transported to their home. I like Jodorowsky´s unique way of seeing the world. He makes films with crazy colors and sounds that make a simple story so incredible and rich. The Cohen brothers for how varied their films are from The Big Lebowsky to No Country Fol Old Man... they know what filmmaking is all about. And Mr. Terry Gilliam produced the best film ever- BRAZIL, ever since I've been trapped by each film he makes.. so much to see, and the stories are deep. Challenges of doing this Film Festival? Creating everything from scratch is a challenge, and also not knowing 100% how people are going to accept Mexican films and wondering who will be attending?! What you are looking most forward to about this event? Favorite spots for drinks in NYC? The Back Room. This place is brilliant! the tea cups and the chilled atmosphere makes me feel that its the place for me. 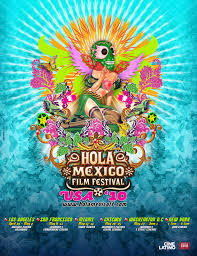 Tell us all about Hola Mexico Film Festival? Thoughts on differences between the film industry here in NY and in Mexico? There's plenty of art cinemas here, the Quad, the Sunshine, Angelika... I think NY is great for art and foreign films, whereas in Mexico, it is much more limited. Is it difficult for producers to find film investors for Latin films now? Its changing, there are plenty of films being produced with government aids, but also there's very successful production companies such as Lemon Films, Panamax and others that are creating great films both commercial and artistic. Truly a New York institution, the Quad Cinema has been showing the best of foreign and independent films for over 25 years. Family owned and operated, the Quad continues to book films which are unique, original, and intellectual to appeal to a loyal following of New York moviegoers. Ex-mayor Ed Koch, a very big film buff and now (among other things) a film critic wrote "The Quad is one of New York's best offbeat film houses".